Although the motor (an elastic band) which makes this automobile go is a short-winded affair, still, if the wheels are easy running, it will go alone for a short distance on a wooden floor. A stronger elastic can be used if the automobile carries a load. If the parts are painted with bright colors before they are entirely put together, the automobile will look very well. First, make the body, then 4-1/4" from the front end and 3/4" from the right side, bore a 1/4" hole in the body for the steering post. This should fit tightly so as to hold the wheels in any position desired. Leather washers are nailed to the post close to the body. The steering post must be put in place before any other parts are fastened to the body. The ends of the rails which are later fastened to the bottom of the body, slant 1/2". The center of the holes for the axles is 3/4" beyond this slanting line and 1/4" above the lower edge of the rails. When boring these 1/4" holes, the rails should be clamped together so that the holes will be exactly opposite each other. The forward holes are made long to allow the axles to swing back and forth. To make this hole, two 1/4" holes are bored side by side and the top and bottom smoothed with a 1/4" chisel. When nailing the body to the rails, put the rear axle thru the holes to aid in keeping them opposite each other. The forward axle is made in one piece and kept so until after the steering "rope" is in place. The axle must be held carefully in place while the brad holes are bored 1/8" from the outer edge of the rails and straight thru the center of the axle. A tight fitting brad is driven into this hole. The steering rope must not stretch; large, hard thread is suitable. Wind a piece about 18" long tightly around the axle about 1/4" from one rail and tie it. 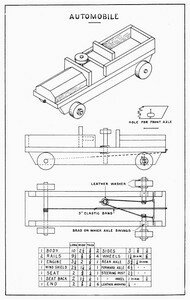 Pass one end thru the small screw-eyes shown in the lower drawing, and wind it around the axle near the other rail leaving no slack in the screw-eyes; then wind six to eight turns smoothly around the steering post, and fasten the end to the beginning with several half-hitches. 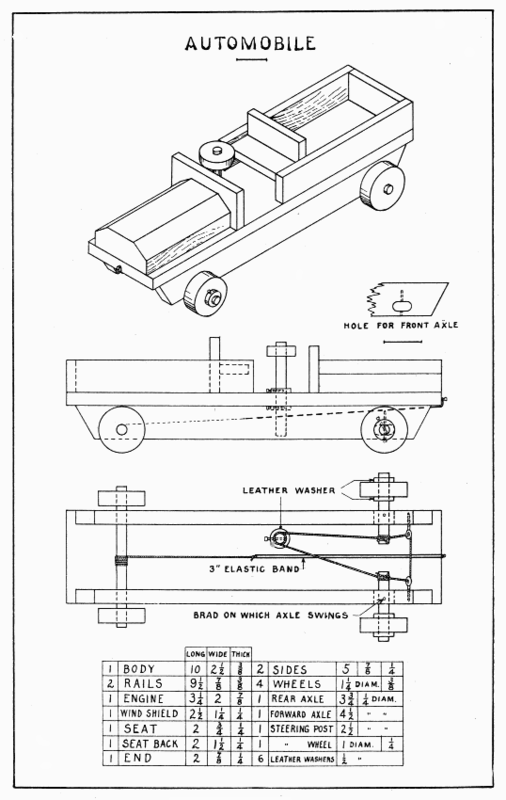 (See diagram for Box Kite at StansPlans.com) A separate thread should be tied around the axle and steering rope at the second place. Should there be any slack, it can be taken up by laying a V-shaped thread over the steering rope near the axle and passing the two ends over the upper side of the axle, and tying them across the steering rope on the other side of the axle. This tends to pull the steering rope together on top of the axle. The wheels can be sawed from short lengths of curtain poles, obtained at a furniture store. The 1/4" holes for the axle, must be bored exactly at the center. The wheels must turn freely on the front axle, but be glued to the rear axle, which must itself turn freely in the rails. After the wheels are in place, the front axle can be sawed in two with a back-saw, using very short strokes, and sawing two cuts nearly thru before either is sawed completely. Nail the wind-shield to the engine, then glue both to the body. Nail the seat-back to the seat so that the top of the seat will be 3/4" above the body, then nail the two sides to the end and to the seat-back and seat. Glue the whole to the body. Nails can be driven up thru the body into the engine, the seat back, and the end, if care is used in locating them. One end of the elastic band (motor) is tied with a bit of string to a brad driven in the forward end of the body of the automobile. On the other end of the elastic band is tied a piece of string about 8" long. This is put just under the body and above the steering rope and wound two or three times tightly around the rear axle and tied. The string and elastic band should be simply straight, the elastic neither stretched nor loose. To wind up the motor, move the automobile backwards on the floor and hold the rear wheels until ready to let the automobile go.